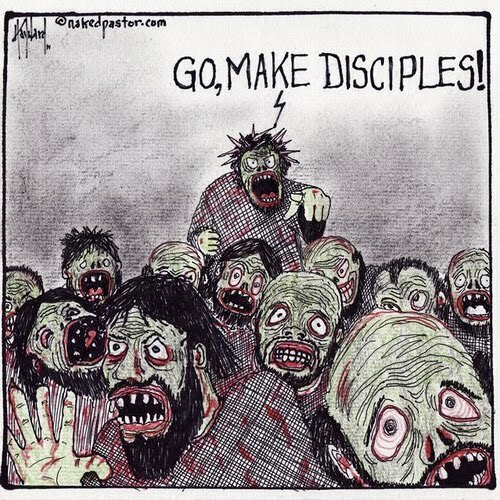 This cartoon is from the fabulous David Hayward at nakedpastor.com. He describes himself as a "graffiti artist on the wall of religion", and man oh man, has he drawn some stuff that hits me in the gut. This drawing is one of them. This was my life in the POS church. After a certain point I was a zombie, tasked with going out to make other zombies. Ewww. I sure hope that's not supposed to be Jesus. I think it's Jesus when he gets distorted for other people's purposes. Actually, I do interpret it more to mean that there are an awful lot of preachers and teachers who would have people go and make disciples of Christ when they have no freaking clue what the heart of Christ is really about. We tend to make it a lot more complicated than it really is and for people who have grown up knowing Christ as more of a authoritarian figure, rather than a humble one, I can imagine it's pretty hard to change the thinking in that. However, I think when one begins to realize their own self-worth, at some point, it gets easier to recognize that Christ values us more than maybe we learned at a young age.